Photographers have been manipulating photos since photography was invented. For example, this photo of a fountain in downtown Washington, D.C. had some distracting elements. The people and the sign in the background pulled your eyes away from the swirling water and of course, the small and barely visible duck. Most of the attempts at photo manipulation in the past when the photographer or editor had to work with negatives and prints were painfully obvious. But improvements in technology have made them almost seamless. I decided to take out the people and the sign. Here is the resultant photo. I would classify this change as a "quick and dirty" edit of the original. But if you look more closely, more has changed than just the editing of the people and sign. Look at the contrast and the colors. If I were going to do a complete edit of the photo, I would have also removed the flagpole on the right side. I might also have removed the light fixtures on the building. If something is missing from a photo, how can you tell? Years ago, there was a commonly used phrase that said, "photos don't lie." But today, with digital images, almost any photo is suspect. I could have put people into this photo as easily as it was, using Adobe Photoshop, to take them out. 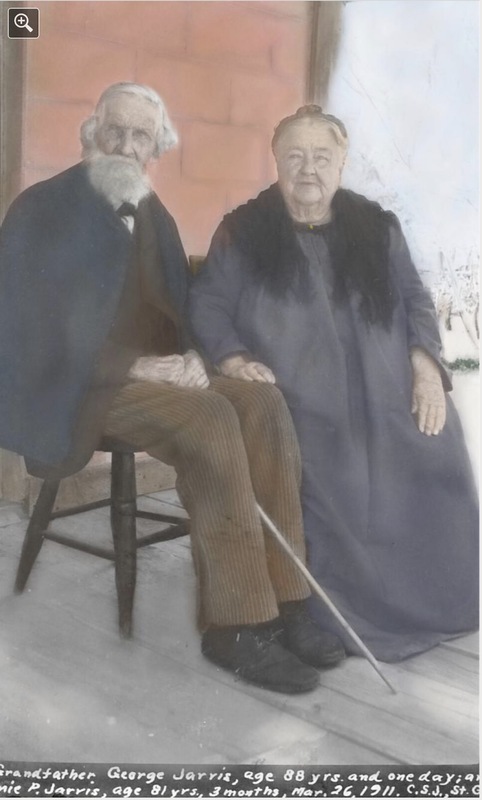 When we modify an old photograph to "repair" the damage of age or to "mend" the scratches we are changing history. A photograph is a historical artifact and should be conserved but not changed. Since I took the photo and I am not trying to represent that it is accurate in any way, am I justified in altering the original for my own purposes? I am not representing that the edited photo is in any way "reality." I am can change the photo any way I want to. 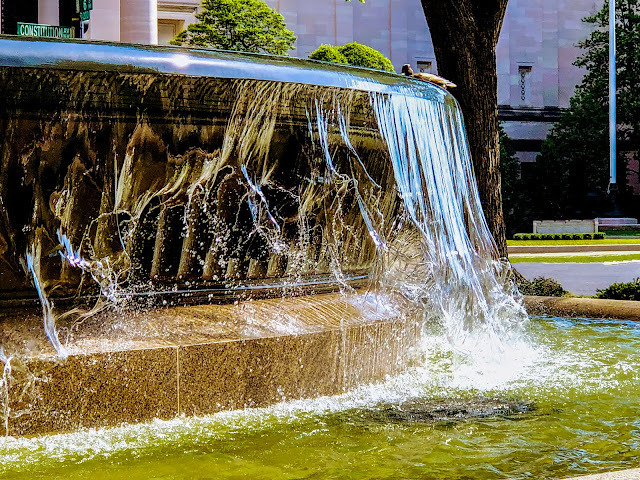 I would suggest that in today's world, virtually 100% of all the published photos you see have been manipulated in Photoshop or a similar program. Does this view of "artistic license" extend to historical photos? I think not. But changing and editing photos is so common as to be ubiquitous. 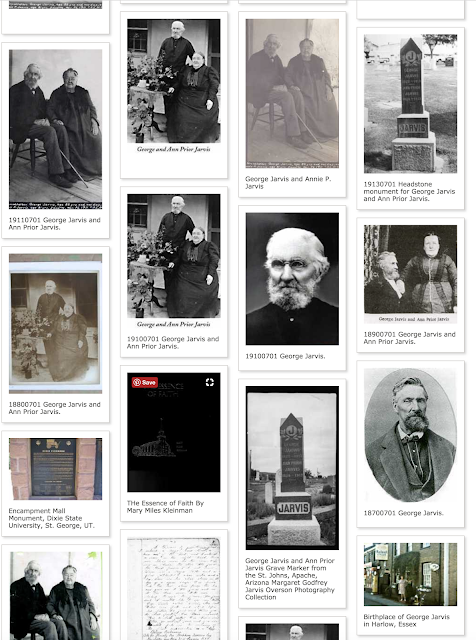 Here is an example of a page from the FamilySearch.org Memories section showing photos of George Jarvis and his wife. How many of these photos have been manipulated in some way? This photo has the notation that it was taken in 1911. Would it help you to evaluate the historical value of this photo to know that color film in sheets for cameras was first introduced in about 1938? You can see from the previous screenshot that this photo was originally in black and white. Where did the color come from? It was painted onto the image. You may like this color photo better than the black and white but is it historically accurate? When I discuss this issue with those who are preserving photos of their ancestors, they often do not care at all whether or not the photo has been changed. They merely want a photo that looks good. Are genealogists historians? Are we entitled to rewrite our own history just as I can edit my own photos? These are real issues but seldom discussed or emphasized by the usual genealogical discourse. Many of my photos have a dual purpose. The first is to maintain some historical integrity. The second is to let my children and grandchildren see what their ancestors looked like. For the second purpose, I use Photoshop to adjust brightness and contrast or to try to restore the original colors in color photos. Any alteration does not change the original which may be faded or scratched. I no way do I change the context or add or remove people from my altered image. Personally, I don't see that I may be altering history. As long as you maintain the original or a scan of the original, that should not be a problem. 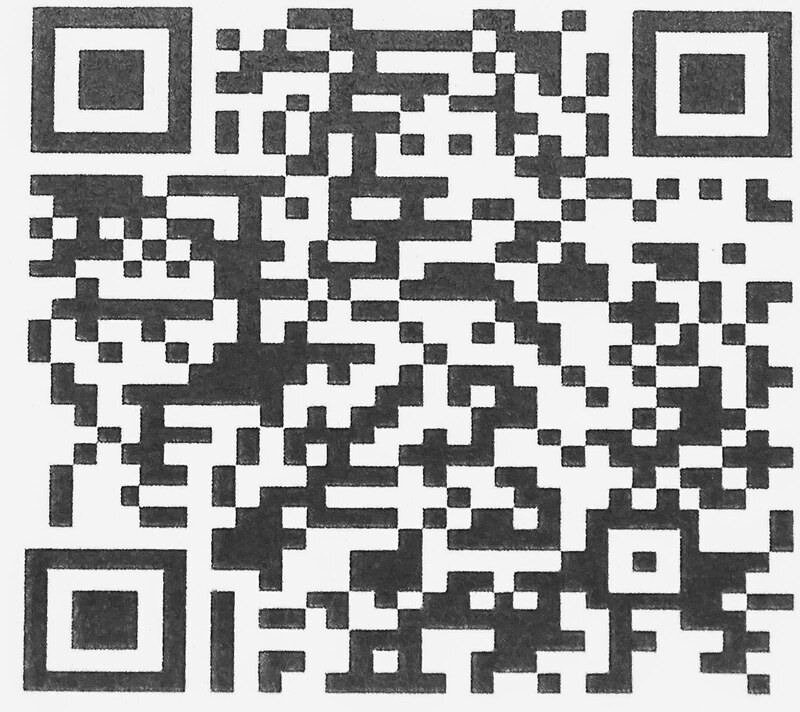 I believe that I should save the original photo, scan it exactly as it is and save it at a higher resolution as a TIF file, then duplicate that file for needed cropping, contrast, saturation, etc. until I am satisfied. I will remove extraneous objects too. I save this photo as a JPG for sharing and enjoying, indicating that it is a version of the original. I enjoy the photo much more this way and I think my ancestors would have appreciated it too! Cropping and removing "extraneous objects" may destroy the historical context of the photo. Archival standards would not really allow even making minor changes to the photos at all. Is the Story of Ancestry.com and DNA Untold? Where is the "Hidden or Deep Web?" Genealogical Data: Private or Public?